The bag house dust collector housing and the hopper are built from 10 and 12 ga sheet steel with reenforcements capable of withstanding 20 in. H2O pressure differential. The 1/4” tube sheet is reenforced and continnously welded in place to protect the bags from the high velocity dust. A removable walkway is installed on all models to 64A. The walkway is fixed on larger models. The hopper is designed with a 60° angle to facilitate the flow of dust and is finished with a flange. A solid square tube structure with bracings form a solid support structure. Pulse cleaning is achieved by an electronic sequencer, with timer adjustment capabilities of the pulse frequency and duration. This control can be used with a photohelic® type control, the pulse sequence will begin only when the high pressure limit setting is reached, and will stop when the low pressure limit is attained. The air to cloth ratio is the most critical variable that can influence the cost of a dust collector, and it’s efficiency. The higher the A/C ratio, the less expensive the dust collector will be. MAXITUBE dust collectors equipped with MPH3 high volume nozzles insure that a strong air bubble will travel evenly within each bag from top to bottom throughout the pulsed row. This great benefit makes MAXITUBE a better collector. High filtration efficiencies are reached by the meticulous choice of the filter fabrics, and the air to cloth ratio (see filter fabric table). MAXITUBE offers a selection of the filtration fabrics the most apt at filtering specific dusts. The following table describes these products. 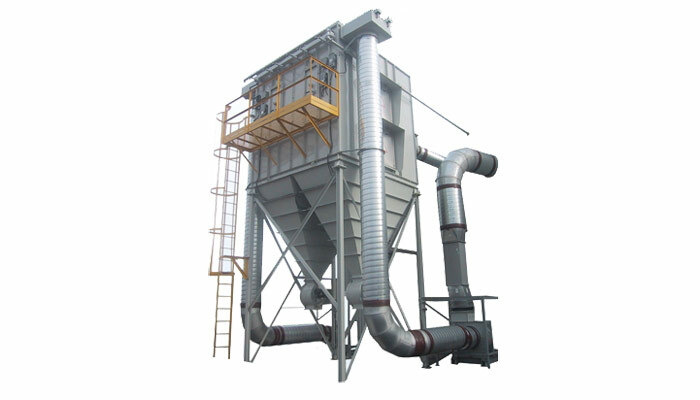 This type of dust collector is usually medium to large in sizes and can handle tremendous air volumes and dust loads. The MAXITUBE is composed of tubes or also called ‘’socks’’ which vary in diameters and lengths. Efficiency needs to be in the upper scale since air usually pumped back into the facility for energy savings. Baghouse collectors are generally installed outside because of their size and weight. Filters are cleaned by compressed air and a control panel regulates the cleaning action and cycles. Safety features such as explosion venting doors, abort or blow back dampers or spark detection systems could be required with potentially explosive or flammable dusts. Typical applications are woodshops, foundries, pharmaceutical and food industries, chemical plants, etc.